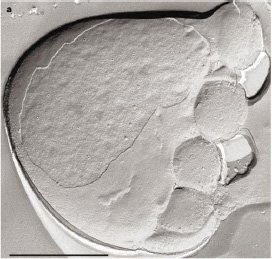 Ignicoccus cell with four 'Nanoarchaeum' cells attached. Scale bar = 1 μm. Image from Huber et al. (2002) via MicrobeWiki. The Archaea have received a great deal of attention in recent years as the supposed Third Domain of life. They are a group of prokaryotes that differ from all others (the Eubacteria) in a number of significant ways - they have a RNA-protein translation system more similar to that of eukaryotes than Eubacteria, they lack the murein that makes up the cell wall of most Eubacteria, and they have a unique tetraether cell membrane that differs from that of the other domains. The study of Archaea has also been influenced by the association of most cultured representatives with extreme environments as thermophiles or halophiles, though environmental PCR studies suggest that Archaea may be much more abundant in the general environment than the cultured diversity suggests (Forterre et al., 2002). Compared to the dog's breakfast that is our current understanding of eubacterial phylogeny, the phylogeny of Archaea seems much clearer. Most studies indicate a basal division of cultured Archaea between two major clades, the Crenarchaeota and Euryarchaeota. Crenarchaeota is the smallest of the two groups and the cultured representatives are all hyperthermophiles, though again PCR samples indicate uncultured mesophilic examples. The Euryarchaeota are much more diverse, including halophiles and methanogens as well as thermophiles. Environmental PCR sequences suggesting archaeal taxa lying outside these two major clades, and one group of them has received the provisional name of Korarchaeota, but until these taxa are properly characterised their existence remains uncertain. So far, the only well-characterised archaeum that has been suggested to lie outside the two main clades is 'Nanoarchaeum equitans'* (Huber et al., 2002). 'Nanoarchaeum' is a minute (400 nm) organism that lives in hyperthermophilic environments as an obligate associate of another archaeum, Ignicoccus. Attempts to culture 'Nanoarchaeum' independently have failed - even growth on a medium of puréed Ignicoccus or separated from an Ignicoccus culture by a semipermeable membrane proved impossible. 'Nanoarchaeum' can only grow in direct cell-to-cell contact with living Ignicoccus. 'Nanoarchaeum' also has the one of the smallest genomes of any organism known, with only about 490,000 base pairs. For comparison, the human genome includes about 3000,000,000 base pairs, that of a lungfish 130,000,000,000 base pairs, and that of the largest known virus, Mimivirus, 1200,000. *I haven't italicised 'Nanoarchaeum' because it's not yet a technically valid taxon. To be valid, a prokaryote name requires publication or validation in the International Journal of Systematic and Evolutionary Microbiology, and this doesn't seem to have happened for 'Nanoarchaeum'. Because of the stringent culture requirements of the Prokaryote Code of Nomenclature, 'Nanoarchaeum' may not be eligible for validation, though it may be recognisable as a Candidatus, the Prokaryote Code's provisional class for a taxon that cannot be cultured independently but can be well-characterised environmentally. The reduced genome of 'Nanoarchaeum' is reflective of its inability to synthesise many of the metabolites it requires to survive, which it draws instead from its Ignicoccus host. This is not unusual among parasitic organisms, though 'Nanoarchaeum' is unusual among super-reduced parasites in its extracellular rather than intracellular position relative to the host, probably as a consequence of the general absence of phagocytosis among prokaryotes. 'Nanoarchaeum' is also comparable to other super-reduced parasites in another way. When it was first described, analysis of ribosomal genes suggested a position for 'Nanoarchaeum' divergent from all other Archaea, which lead to its promotion as a new archaeal phylum. However, studies of comparable eukaryotic parasites have indicated that they have usually undergone exceedingly rapid evolution that has exaggerated their differences from their more mediocre relatives. Ribosomal genes in particular seem to be very prone to such long-branch distortion. The prime example in recent years has been the Microsporidia, intracellular parasites that were once thought on the basis of ribosomal genes to be one of the earliest-diverging branches of eukaryotes, but have since been reinterpreted as highly-evolved fungi. Phylogenetic analysis results from Brochier et al. (2005) showing association between 'Nanoarchaeum' and Thermococcales. Unconstrained unrooted maximum likelihood trees of (a) elongation factor EF-1α, (b) elongation factor EF-2, (c) subunit A of topoisomerase VI, and (d) Bayesian tree of reverse gyrase. Bold numbers at nodes are bootstrap values; the other numbers are the Bayesian posterior probabilities. Scale bars represent the number of changes per position for a unit branch length. With this in mind, I was not overly surprised to see the results of Brochier et al. (2005). Brochier et al. took a slightly different tack to understanding the phylogeny of 'Nanoarchaeum' - as well as using a wider range of genes, Brochier et al. also calculated the open reading frames (ORFs) of the entire 'Nanoarchaeum' genome (an ORF is a section of the genome that could potentially code for a protein) and compared them to those of other Archaea. The ORF analysis found that 'Nanoarchaeum' shared the majority of its ORFs with Euryarchaeota, and was particularly similar to members of the order Thermococcales. This result was corroborated by a number of the gene analyses. The basal position of 'Nanoarchaeum' in the ribosomal trees would therefore appear to be due to long-branch attraction, possibly exacerbated by lateral gene transfer with its Crenarchaeota host. Brochier, C., S. Gribaldo, Y. Zivanovic, F. Confalonieri & P. Forterre. 2005. 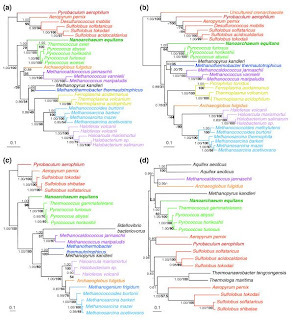 Nanoarchaea: representatives of a novel archaeal phylum or a fast-evolving euryarchaeal lineage related to Thermococcales? Genome Biology 6: R42. Forterre, P., C. Brochier & H. Philippe. 2002. Evolution of the Archaea. Theoretical Population Biology 61 (4): 409-422. Huber, H., M. J. Hohn, R. Rachel, T. Fuchs, V. C. Wimmer & K. O. Stetter. 2002. A new phylum of Archaea represented by a nanosized hyperthermophilic symbiont. Nature 417: 63-67. "Because of the stringent culture requirements of the Prokaryote Code of Nomenclature, 'Nanoarchaeum' may not be eligible for validation, though it may be recognisable as a Candidatus, the Prokaryote Code's provisional class for a taxon that cannot be cultured independently but can be well-characterised environmentally." When was the Prokaryote code established? The requirement for pure culture sounds to me like a holdover from the 19th century, when so much less was understood about microbial ecology, and of course the technology for studying it wasn't really there. While microbiologists can and do study organisms that can't be formally named, I nonetheless fear that this situation may be contributing to misunderstandings, since for one thing named taxa are often counted as a proxy for diversity, or are the only ones placed on lists. It's not such a big deal for specialist microbiologists, who do know better, but I suspect that doctors (for example) may be really misled. Are there proposals for adding the methods that modern technologies make possible as ways to name prokaryote taxa? The Prokaryote Code was established quite recently, in 1980, and I believe it's been revised a couple of times since then. Previously bacteria had been covered by the Botanical Code, but an ever-increasing load of ill-defined and often unrecognisable taxa lead to the establishment of the new code to meet the special requirements of working with bacteria. In many cases, it was exactly the absence of a requirement of culture that rendered the taxon unrecognisable. Because bacterial taxa are generally identified by physiological features, the 'type specimen' for a bacterial species is an isolated culture, not a preserved specimen. The impression I get from the literature is that microbiologist are much more comfortable using provisional taxa than other biologists. Bacteria are usually given strain numbers before being formally described (and when describing a new species, the author(s) must indicate the strain number of the type), so if a strain is not able to be described in enough detail to be formally named, it can still be referred to by strain number. For instance, ATCC 11775 is the type strain for Escherichia coli, where ATCC would be the code for the institution where the strain is stored. 'Strain 121' is a strain of an unnamed bacterial species that has the highest recorded growing temperature of any life form, being able to grow at 121°C. Surprisingly few researchers have taken advantage of the Candidatus option in bacterial nomenclature, but a Candidatus is an effectively described taxon (one example of a taxon described as such is Candidatus Glomeribacter gigasporarum, which lives as a symbiont of endomycorrhizal fungi). Candidati are not assigned full taxonomic status because (a) no proper type culture exists, and (b) if a Candidatus taxon is ever fully isolated, it may turn out to be a species complex or something similar. And So Much Yet to Do! In a bunch, in a bunch! How Irritable is This Bird?